Back in October of last year I attended the Toronto After Dark Film Festival for the first time. 2011 was also my first year as a film blogger, and I was struggling with writing reviews for films that weren’t all that great, but weren’t terrible either. It was a cinch to write positive reviews, but going into Deadheads I thought I was going to be for a tough night at the office. I mean a zombie\buddy\roadtrip movie? Really? I would have had more faith if Joe Dante was at the helm for what was sure to be a horror\comedy, but he was nowhere to be found. Instead, the movie was made by a couple of guys making their first feature who called themselves the Pierce Brothers (Brett and Drew). Fortunately, Deadheads didn’t feel like a first feature at all! In fact, it turned out to be one of the highlights at the festival for many audience memebers, evidenced by the Bronze audience award Deadheads took home. The list of Deadheads fans would also have to include myself; check out my review. Although Deadheads is a bit of a bizarre genre mash-up, the Pierce brothers have managed to make it work wonderfully, and any self-respecting horror\comedy fan needs to check out this movie. Below is an interview with half of the writer\director team that made Deadheads, Brett Pierce, and information about the DVD release so you can go on a zombie roadtrip of your own! 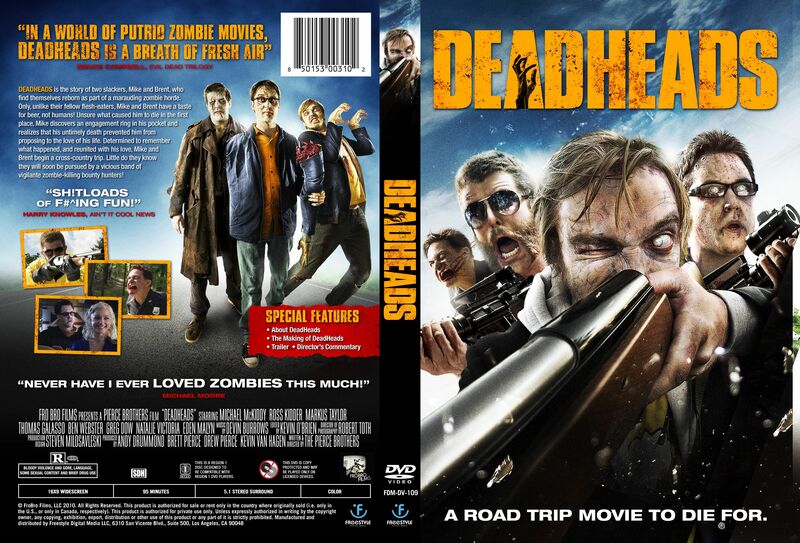 Deadheads was one of the best movies at Toronto After Dark 2011, garnering the bronze fan award. What’s it been like to write and direct your first feature aside your brother Drew and get this kind of positive response? Brett: We feel incredibly lucky. When we completed principal photography on DEADHEADS we had blown the entire budget and had zero idea how we were going to complete post production. On top of that, Drew and I were beyond broke. We came back from Michigan to LA after the shoot with pennies in our pockets and maxed out credit cards. We took low paying production assistant jobs because that was all we could get. It was dark days and we had no idea how we were going to finish the film, but were unreasonably optimistic and just refused to give up. We didn’t know whether to laugh or cry. I laughed but I think that was the insanity kicking in. To be at this point is a dream. Horror comedies have to be one of the most difficult genres to get right, they often miss the mark. Why do you think you were successful with a zombie\buddy\roadtrip movie? On paper it seems like such a bizarre concept. Brett: I think it works because Drew and I were so dead set on making the characters relatable. I think in Hollywood everyone is obsessed with the pitch or the concept but I could care less about that as long as I’m hooked on the characters. If you make the most interesting and endearing tale about cricket playing ninja rhinos, I’ll watch, and then buy your action figure with rhino ninja sword swinging action. Drew and I were just so excited about the idea of zombies on a road trip. It screamed fun to us and we agonized on how to make such a ridiculous idea work as a comedy but also something an audience could relate to. It’s about a guy trying to find his long lost love but in our case it’s zombie love. You had such a great cast to work with, Michael McKiddy, Ross Kidder, and Markus Taylor (to name a few), what was it like to work with these guys? Brett: It was a party in a way. We’re all friends and we all went through this crazy ride together and as stressful as it was on a daily basis, we all knew we were exactly where we wanted to be. Mike, Ross, and Markus are just the guys you dream of working with your whole life as a filmmaker. Most of our shoots we’re a minimum of 14 hours and in a lot of cases it went up to 20. When actors stick through that kind of hell with you and still deliver 100% on every take, you know you cast the right people. I remember one instance, we were shooting at this abandoned bar for nearly a week and it was our last night there. We had just wrapped after like 18 hours and the sun was coming up. Drew and I we’re exhausted but the bar was trashed from shooting so we’re in there with the crew wiping down walls and sweeping the floor. I remember looking up and seeing that all the cast from that night and, some that weren’t shooting that evening, were all there cleaning and packing up. There was no division between cast and crew. It was all just good people. What do we need to know about the DVD\BLU-RAY release for Deadheads? When and where can we get it? Which horror movies have helped you get to this point in your career? Brett: Well Evil Dead was the biggie for Drew and I but that’s because we grew up amid the production of it. We had a film crew staying in our mother’s house running up her electric bill and eating all her food so it made us feel confident we could do that to mom again when we shot DEADHEADS. Inspiration wise I would say John Carpenter had a huge effect on us. Halloween and The Thing are just so damn perfect it makes me want to cry. Poltergeist and American Werewolf in London are favorites too. As specific to DEADHEADS though I would say it owes a lot to The Goonies, Back to the Future, Gremlins and kind of the Amblin era of the 80’s. What’s up next for the Pierce brothers? Another horror themed film? Brett: Horror that will rip your face in two! Ha! We’re working on a very creepy adventure flick that’s all tied into Halloween myths and Irish mythology. We’re steering more towards a scary Indiana Jones type story this time. We love adventure films, but were very excited to experiment with building tension with the more horrific elements of the story. We love movies that take place during All Hallow’s Eve. It’s the one night of the year when the spirit is closest to ours so that opens the door for all sorts of demented ideas.